Well it looks like Spring might have actually arrived - at last ! I have been playing with my new Distress oxides, and after experimenting I ended up with a colourful background for this Spring Joy scene. I love Hares I don’t think I have ever actually seen one in the wild in person, but I adore them. I sat this darling hare by Hobbyart in his meadow, and stamped and fussy cut a flower stamp to keep him company. I love using dried flowers and items from nature, so of course they made up the meadow too. I stamped my assortment of hare stamps in a curve over the main hare, they look like they are having lots of fun! By the time I was finished it was much too large for a card, so I punched some holes in the top and hung it up with some pink raffia. Thank you for visiting the hares today, have a lovely day. 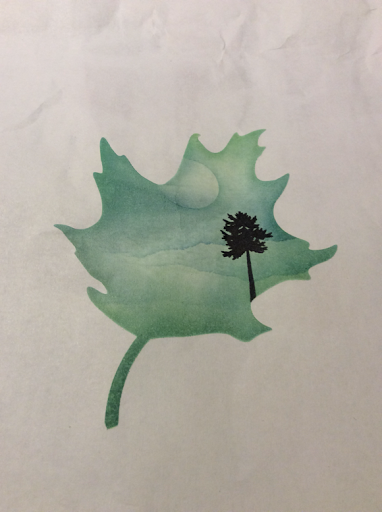 Hello, today I am continuing my story, which I started before Christmas with Lavinia Stamps. I created the card using Lavinia Stamps and die cuts, Distress Oxide inks. and lots of love. The young hare had been desperately searching for the beautiful lady hare he had kissed under the mistletoe on Christmas Eve. He had searched every inch of the forest, but could not find her, and he was very, very sad. Then one bright morning in early March, he spotted her just the other side of the magical tree which stood on the very edge of the forest. He rushed towards her, “where have you been” he called. “Are you alright now?”.he asked anxiously. Thank you for visiting, I would like to enter this into the Penny Black and Stamping Sensations challenges. Oh my goodness isn’t it cold ! Did somebody forget to tell the weather it’s March ! To take my mind of the weather I have created with this lovely Lavinia Fairy I received her for Christmas, but I have only had time to use her now. I have been busy designing with wonderful stamps. and I am of course very happy and grateful for that. I have at last also got around to using the new Tim Holtz Distress Oxides, Only 3 colours to start with Picked Raspberry, Broken China, and Bundled Sage.I used all three to create the background for this card.I dabbed them onto my ink blending mat, and spritzed over them with water. I laid my card into the inks, and lifted it up to reveal the results, it looked like a watercoloured background. I kept dipping the card into the inky puddle until it was covered. I would like to enter this Fairy card into the following challenges. If you remember my story from 12th December about the hare waiting under the mistletoe, this is the next installment. For the next 11 days he continued to wash and fluff himself, and travelled to the three pines, to stand hopefully under the mistletoe.. but nobody ever came. On the 12th day which also happened to be Christmas Eve, he decided this would be his very last visit. He hopped along with hope forever in his heart. As soon as he turned the corner into the three pines he saw the most beautiful and dazzling lady hare waiting patiently under the mistletoe. 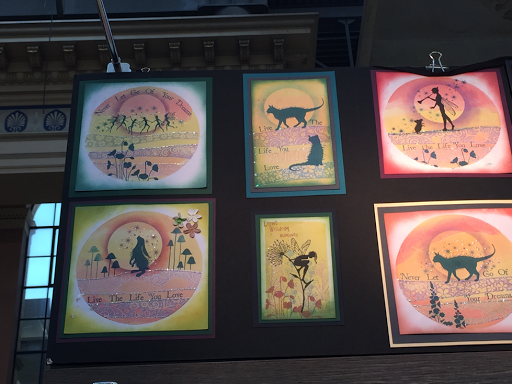 All of the stamps I used to create this magical scene are by Lavinia Stamps. Thank you for hopping by, I would like to enter this into the following challenges. Great, Great, Great Grandfather Blitzen watched proudly as the young Blitzen took flight on his inaugural Christmas Eve Flight to bring joy and happiness all over the world. Thank you for flying by ! I would like to enter Blitzen into the following challenges. 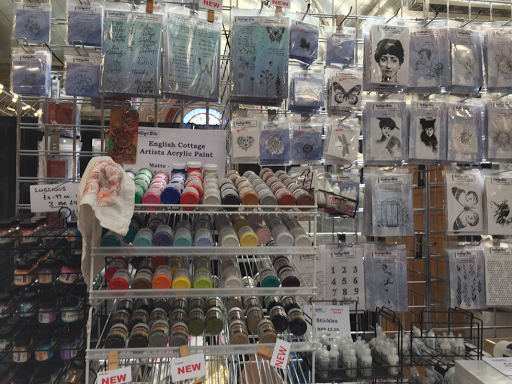 I decided to brave a visit to the Ally Pally Craft Show today. It was very, very busy So we didn't stay long, as I am not too well. I always like to use natural elements in my projects so I was delighted to discover Anna Marie Designs. They have the most gorgeous natural products and stunning creations! 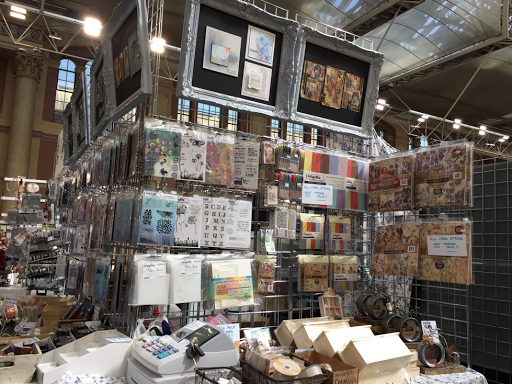 Clarity Stampswere very busy and I tried to watch Barbara Gray give a demo, I couldn't see much but the finished result was wonderful! 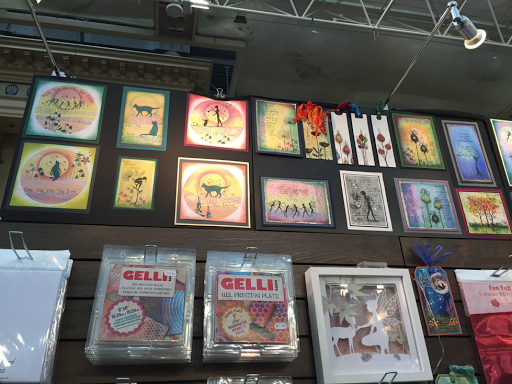 Jenny Maye was there with Hobbyart too, with lovely projects by the Design Team. I am finally seeing the surgeon next week.I hope he will say that something will be done to unblock my artery.I am trying to do a little crafting each day. These two lovely Fairies are overlooking their field of dandelions. At midnight thousands of fairies emerge from the dandelions and twinkle and sparkle as they flitter around. Some of them fly away and grant wishes for special,people, while others stay in the field and play and create magic. A sideways view of the card, the wings fold inwards so it fits in the envelope! I watercoloured the background and stamped and heat embossed the dandelions and the lovely sentiment. Thank you Fairy much for visiting us today. Country View Challenges Things with Wings - oh dear I hadn't better call the fairies things! This Majestic Deer stands proudly in his field of Lavender. He also loves to sleep in the Lavender field too as it soothes him to sleep. I created the background with water colours, and stamped the Lavender with two colours of Adirondack inks. I have heard a lot of good things about the new Distress Oxides so I am thinking about trying them out! I fussy cut some of the Lavender flowers and adhered them with foam pads to give some depth to the picture. I hope you are all enjoying the summertime and all of the glorious flowers in bloom at this lovely time of year. Inside the magical Fairy world! 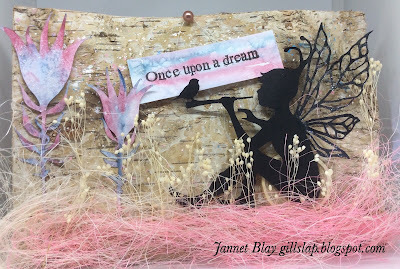 I used a Tando Creative Mini Printer Tray for my Magical Fairy book. As I was going to use Watercolours,I put a coating of gesso onto the pieces first. I stamped Lavinia Stamps onto shrink plastic and shrunk them down, so they would be just the right size to sit happily in the printer tray. And the deers, and horses, and don't forget the hare.. I would like to share this into the following challenges. I added lots of glitter, and glossy accents on the bubbles, not sure if they show up very well in the photo. I used Lavinia Stamps and Die cuts to create this card and lots of watercolours! Tread quietly... today we are peeping into a magical land... can you see the lovely horse and foal.Did you know that at midnight every night the fully grown horses start to magically grow a beautiful horn and turn into magnificent unicorns for the night. In this picture the mother is whispering to her child telling her all about the enchantment she will enjoy when she is older ! If you would like to make an exploding canvas you can find many and varied videos on you tube to give you the basics. I used Lavinia Stamps and Die cuts to make this magical land.I watercoloured the images and canvas, and I used pearl stickles on the enchanted toadstool, and a signo white pen on the pink flowers.I also slotted in some skeleton leaves to add more layers and depth. Thank you so much for visitng today and taking a peep into this magical world! This is my dream of a world where everyone is kind and considerate, law abiding, and there is no illness, disease or disability. I watercoloured the background,and stamp embossed some ivy in enchanted gold. I bought the Hares to life with watercolours, and used more watercolours to make the flowers bloom and the little butterfly fly! This is the card folded down, I just need to buy an envelope to fit it now! I almost did not go to Ally Pally as I wasn't very well in the night, but I was determined! 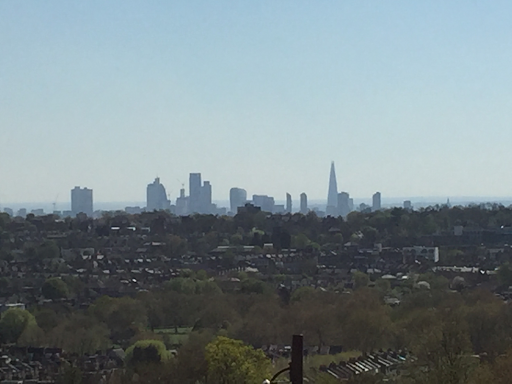 It was a wonderful day and turned out to be a lovely sunny day here in London too! 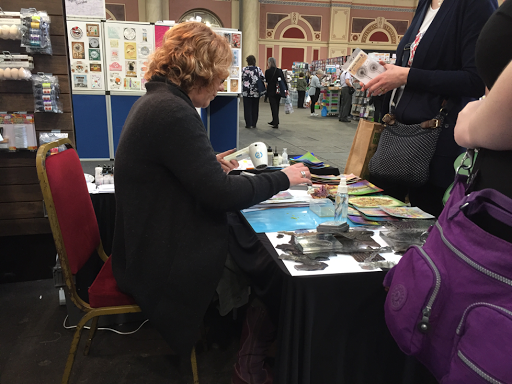 I had a lovely time watching Tracey of Lavinia Stamps demonstrating her gorgeous stamps. It was so nice chatting to her about all things fairy and magic! It's nice to escape into a magical world far away from reality sometimes : ) I treated myself to a few more stamps! Look at the gorgeous work of the Design Team!! 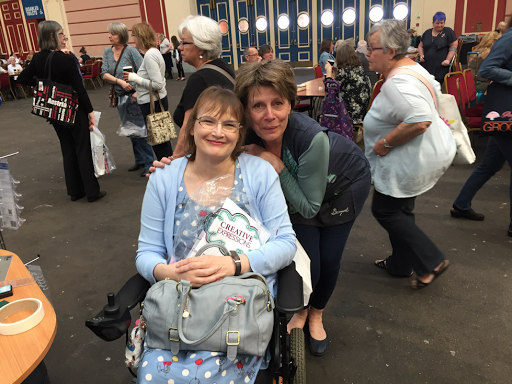 I also met Barbara Gray from Clarity Stamps who was so lovely. She even gave me this picture she had just made in her demo! Thank you! I eventually found the wonderful Indigoblu! I am annoyed with myself as I did not take a photo of Kay's wonderful face canvases. I was too busy admiring them ! Be sure to stop by the Indigoblu's Facebook page as there are very, very generous competitions happening !